Exterior signs advertise your business while helping existing customers find your location. If you have a logo change of any kind, one of the first steps you need to take is updating your signage so the public can be aware of this change. In July we blogged about a logo box repair we did for our long time customer, Viking River Cruises. They now offer ocean cruises along with river cruises which prompted the company name to change to Viking Cruises. We have worked with Viking Cruises for years and we were happy to help them with their signage change due to the company expanding. They wanted a completely new sign that looked identical to the existing one to be made for the other side of the building. We made a brand new set of channel letters and a logo box. 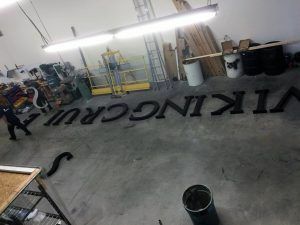 In this blog we’ll be focusing on the channel letters we made. Stay tuned for next week’s blog where we’ll go into more detail about the logo box. Their building is at the intersection of two major streets in Woodland Hills, California so they wanted to take advantage of that and advertise to both sides of traffic. Once we completed the permitting, we were able to start on the project. 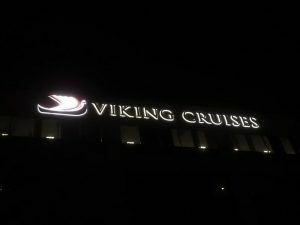 For the words “VIKING CRUISES” we made halo-lit channel letters. Halo-lit, or reverse-lit, means that the LEDs are installed inside of the letters to face the wall. Each letter is installed with spacers to give the light room to illuminate which creates a halo-effect around each letter. To make sure that the light only comes from the back of the letters, the faces and returns are made from aluminum. The back of the letters are made from Lexan which is a UL approved polycarbonate that is clear so the LEDs can shine through. The face and returns were welded together and painted black before we attached the LEDs and the Lexan back. For this sign we used white LEDs but there are a few color options that you can choose from depending the kind of look you want for your sign. The channel letters are identical to the existing sign and look great at night time. Remember to check in next week for part two where we will discuss the logo box we made for the sign. 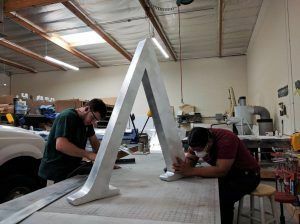 Feel free to check out our gallery online to see other reverse-lit/halo-lit channel letters we have made. Since we make these from scratch, we can make channel letters that match your logo perfectly and include your custom colors.